Free Woodworking Plan.com – Page 968 – THE Free Woodworking Plans and Projects Resource since 1998. Updated daily. Our camper trailer just does not have a good place to mount one of those plastic paper towel holders so I decided to make one for the counter. This is a simple project that requires a little imagination. Cranberry Scoop Easy to Make. Cranberries are in season and you will need a berry hand held rake (scoop) to make sure you get every last one. Well not really, this is a decorative scoop that is based on some designs I have seen of old cranberry scoops. Recently, when tuning up my table saw, I discovered that the face of the rip fence was not square to the saw table. And there was no way to adjust it to remedy the problem. Rather than admit defeat, I decided to add an auxiliary fence to the rip fence that could be easily adjusted. Table Saw Sleds are great for making accurate cuts. They are also really good for making set ups for repeatable cuts. 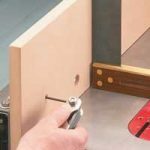 We think you will find this an easy yet great addition to your woodshop tools. This project was inspired from an article I saw in one of my woodworking books. Unfortunately I could not find the book again so I made my own plans. If you have a small shop like mine then every square inch of space needs to be optimized. This miter saw/planner stand helps serve that purpose. It will get my planer off of the bench and not take up much more area than my miter saw currently uses. It also gives me a couple of really nice drawers to store things. Recipe Holder are Easy to Create. This is a pretty easy project that complements Marilyns place/recipe card project. The idea is to make lots of these for gifts when people come for brunch or dinner. The holder can be used for table place setting and then later for a recipe card holder. 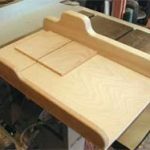 Free Woodworking Plan to Build a Handy Plywood Carrier. One of the more awkward things to handle around the shop is big sheets of plywood. With my bad shoulder it is almost impossible but with this handy plywood carrying device its a breeze. Put the plywood in the notch, pick it up with the handle and balance the top with your other hand. Now that is a lot better than the alternative! Picnic time is coming soon and eating outside is always fun. One thing about eating outside that is not fun is when the napkins blow all over the place. This handy napkin holder will prevent that from happening and looks nice too.